The study, conducted from March 31 to April 18, surveyed 1,040 members of March for Science Facebook groups or pages about their reasons for marching in April 22 events across the United States and around the globe. Fully 93 percent of respondents said "opposing political attacks on the integrity of science" would be very important to them as a reason for participating in a March for Science event. At the same time, 97 percent of respondents said that "encouraging public officials to make policies based on scientific facts and evidence" was a top priority, and 93 percent said the same for "encouraging the public to support science." 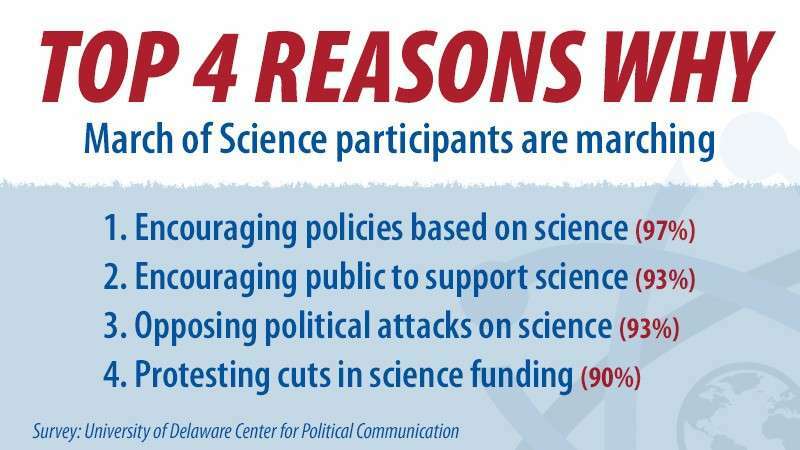 Other reasons that most respondents rated as very important included "protesting cuts to funding for scientific research" (90 percent), "celebrating the value of science and scientists to society" (89 percent) and "promoting science education and scientific literacy among the public" (86 percent). Fewer respondents ranked "encouraging scientists to engage the public" (70 percent) and "encouraging diversity and inclusion in science" (68 percent) as highly. Nevertheless, solid majorities said these reasons were very important. The survey also asked respondents why they had joined or followed March for Science pages, groups or hashtags on social media. Not surprisingly, the top reason (93 percent) was "to learn about March for Science events." A majority (54 percent) also said they joined "to connect with people who share my views." Other common reasons for joining or following included "to become more involved in politics or policy-making" (45 percent), "to learn about other online advocacy and activism opportunities" (41 percent), "to learn about issues facing scientists and scientific institutions" (36 percent) and "to learn about other offline advocacy and activism opportunities" (32 percent). Only a small percentage of respondents (12 percent) said they joined or followed "to learn about science." When asked whether their experiences with March for Science social media pages, groups or hashtags had made them more likely to participate in science advocacy, 78 percent of respondents said yes for online advocacy and 74 percent said yes for offline advocacy. In addition, large majorities said their experiences had made them more likely to like or share (76 percent), read (70 percent) and write (64 percent) messages about science on social media. Almost two-thirds (64 percent) said their experiences with March for Science social media had made them more likely to contact public officials about science. Majorities also said their experiences had made them more likely to discuss science with people they knew (59 percent) and to follow news about science (55 percent). Can social media connect science and society?